Stravaganza is a very exciting and unique card game where you compete with the Dealer. Like blackjack, Stravaganza is a casino card game based on total point values. The game is played with 5 decks of cards and the object is to have a higher point total than the Dealer. The card values are the same as in blackjack: picture cards in Stravaganza are worth 10 points, Aces are worth 1 and all other cards are counted at their face value. The difference between Stravaganza and blackjack is that you cannot ‘bust’, e.g. exceed a certain card total. The more points you have, the better. For a fixed side bet of $1 you can activate progressive jackpot game. 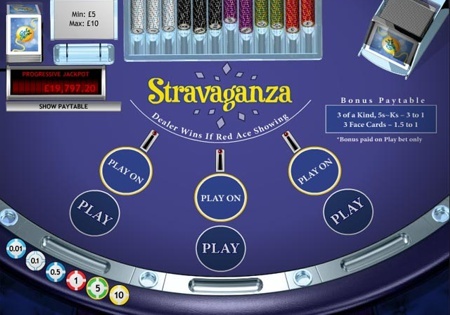 Playing Stravaganza is simple and the number of betting options is where the real skill come into play. You simply click on the chips of your choice, in order to place your initial bet. Then, by clicking on the 'DEAL' button, you are dealt 2 cards face-up and the Dealer is dealt 3 cards, albeit face down. Depending on the total value of your cards, you can choose from a number of options such as whether to increase your wager, or get half or all of it back. Money Back - When your cards add up to 5 or less, you can choose to get your entire bet back, and by doing so, end the round. Rescue Bet – When your cards add up to between 6 and 9, you have the option of getting half your bet back and which will also end the round. Sit - When your Stravaganza cards add up to more than 10, you may ‘Sit’ and play your two cards on your opening bet. Play On - Regardless of the total sum of your first 2 cards, if you opt to Play On, a second bet equal to your first bet is automatically placed. You are then dealt a third card with the hope of boosting your point total. Then the Dealer’s hand is revealed. If the Dealer’s total is higher than yours, you lose all your bets. When your total is higher than the Dealer’s, you win! There is but one exception to that, for when the Dealer's hand contains a red Ace (hearts/diamonds), your first bet is forfeited and your second bet is a push (returned to you), regardless of your total card value. Sizable bonuses are also paid out on various poker-like hands. For instance, a Three of a Kind pays 3 to 1 on the amount of your first wager, and all face cards pay 1.5 to 1 on your first bet. Stravaganza also provides you with the exciting opportunity to place a progressive jackpot side bet. Whenever you receive a winning card combination, you win part of the progressive jackpot. Draw 3 Kings of Hearts and the highest jackpot prize of all is yours!